[Sir Henry Halford, Physician Extraordinary to four monarchs, including George III in his madness.] 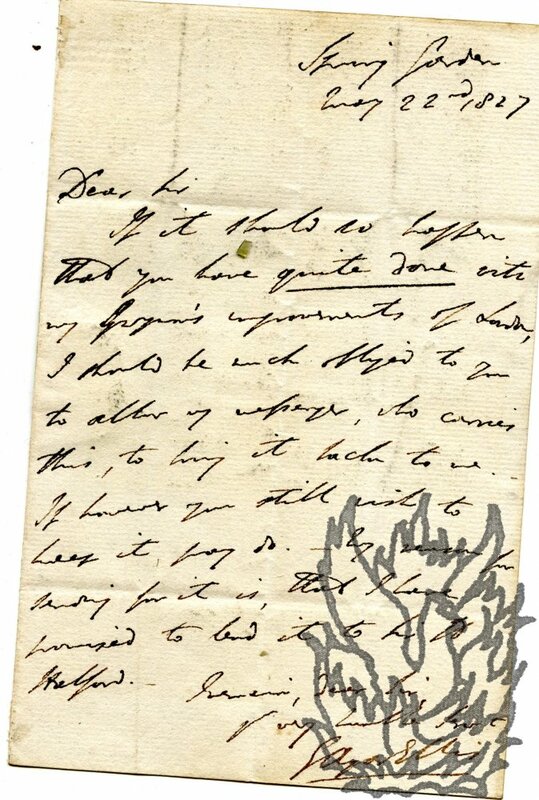 Autograph Letter Signed ('Henry Halford. '), mentioning 'the King' (George IV? ), and referring to a child of 'Lady Harriet' (wife of the recipient). Wistow Hall, Leicestershire. 21 August [no year, on paper watermarked 1825]. 1p, 4to. In fair condition, lightly aged. With thin strip of paper from mount adhering to the blank reverse. The recipient is not named. He informs him that he will 'not be in Town' before the following Monday, instead of the Thursday, explaining that he 'was not able to leave the King until Saturday last – and a sejour here of less than a week would hardly justify a journey of 103 miles and back again'. Pall Mall [London]. 7 November [no year]. 4pp, 4to. Bifolium. In good condition, lightly aged, with thin strip of tissue from mount adhering to one edge. Folded three times. 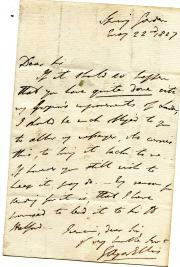 An interesting letter, in which Halford asks Ellis for assistance in the writing of royal biographies for the Royal College of Physicians (of which he was President from 1820 to 1844), while explaining that it would not be 'proper' to go 'lower' than George II. Autograph Letter Signed ('G Agar Ellis') to Jerdan, with seal. 22 May 1827; Spring Gardens [London]. 12mo, 1 p. In a bifolium, addressed and docketed on the reverse of the second leaf, to which the red wax seal adheres, in good condition with a clear impression of Agar-Ellis's monogram. Fair, on aged and grubby paper. If Jerdan has 'quite done' with Agar-Ellis's copy of 'G<?>'s improvements of London' asks if he will allow Agar-Ellis's 'messanger' to return it. 'If however you still wish to keep it, pray do.' Agar-Ellis has 'promised to lend it to Sir H Halford'.